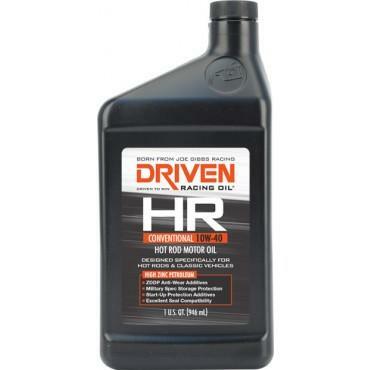 Driven Street Engine Oil - Conventional - HR 10W-40 UNIVERSAL - Dezod Motorsports Inc - Home of the automotive performance enthusiast since 2002. Well suited for a variety of hot rods and vintage vehicles and is appropriate to use in any engine that calls for a 10W-40 grade motor oil. Features storage protection additives that guard against rust and corrosion during winter storage. This oil is an excellent choice for muscle cars and rotary engines. No ZDDP or additives required. Viscosity typical of 10W-40. STORAGE PROTECTION – Uses the same oil additive technology developed for the U.S. Military for storing and shipping their combat equipment. Protects against rust and corrosion so your engine is protected even when it’s not running. HIGH ZINC CONTENT – Higher levels of Zinc (ZDDP) than regular passenger car oils. Delivers proper anti-wear protection for older style push-rod and flat-tappet engines. CAMSHAFT WEAR PROTECTION – Superior camshaft wear protection chemistry. The same wear protection found in Driven Racing Oil which has powered Joe Gibbs Racing to multiple NASCAR Championships.